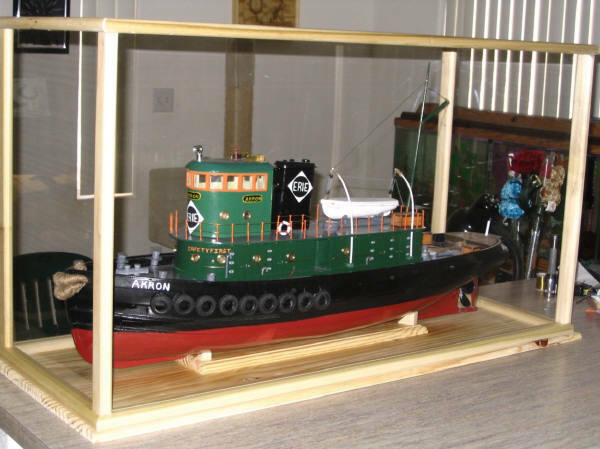 My name is Gerald Newcomb, I have not been building models for years, But recently a gentleman I build display cases for gave me a model tug boat that he purchased in 1988.Ive seen the work he's done and took an interest in it so he gave me the boat ,WOW what a lot of work but well worth it in the end .I have yet to find another like if you know of anyone I would love to see it, anyway here are my photos. Compliments of Mark J. Price and the Akron Beacon Journal. had a 750 horse power rating. She had a six man crew -a captain, mate, two deck hands, engineer and oilier. For the greater part of the 20th century the Akron pulled her weight around New York harbour for 38 years. 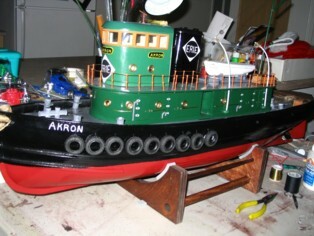 By 1952 the Erie railroad announced that a new Akron tug would take it's place. The weather beaten boat was retired . Although her final fate was not disclosed. 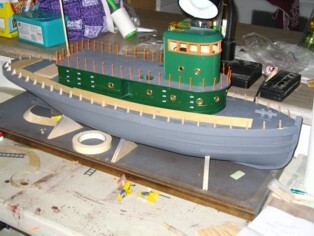 The 215 ton replacement boat was built at the Bethlehem Steal ship yard at Mariners harbour on Staton island, NY. It was about 3 feet shorted and 4 feet wider than the original vessel. The new Akron took up where the old one left off in New York, In 1960 the Erie RR merged with the Delaware, Lackawanna and Western, forming the Erie Lackawanna Railroad. Having suffered a series of financial setbacks before filing for bankruptcy in 1972.Conrail took over in 1976.Properties were sold off .Equipment was liquidated. Since many of the Erie tugs are no longer with us, it seemed likely that the Akron had been scrapped over the last 25 years. ''Oh, yeah . The Akron. We have her,'' said Doug Della Porta, owner of Eastern Towboat Corp. in East Boston, Mass. for about six years but we got everything running . "The first thing he did was renamed it the Akron. That was the original name." 'He said. "If anyone isn't curious, the asking price is probably right around $75,000." For more info. 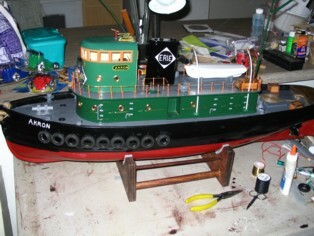 go to http://elhts.org/ Eastern Towboat Corp. is at 404 Border St..East Boston. I would like to thank, Mark J. Price and the Akron Beacon Journal for this article.